The historic range of Silverwood Discover the 7 essential coulours of the brand reference in external cladding for more than 20 years, recognised by all for its simple & timeless architecture. 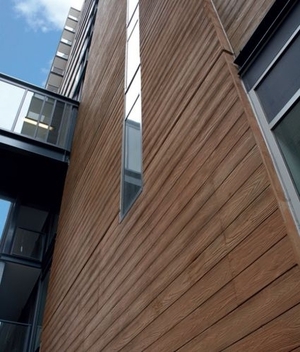 Siding can take the form of boards, strips or panels. Manufacturing techniques include the use of solid wood, plywood and laminates, among others. Pine, oak, cedar, spruce, teak, mahogany, fir, birch and other types of wood are used. Choice will depend primarily on wood type. This will determine the siding's texture, color, structural qualities and suitability for the region's climate (humidity, freezing temperatures, wind, UV, etc.). Wood should be treated against mold, termites and other insects. Professional advice and installation are highly recommended.